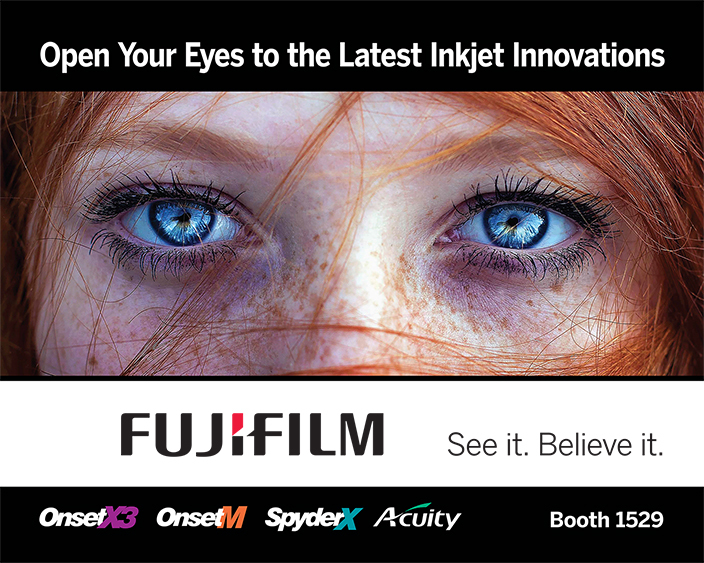 As a platinum sponsor of SGIA Expo 2017, the Fujifilm exhibit – located in booth 1529 – will give attendees the opportunity to see how innovations in inkjet technology are changing the dynamics of print. Fujifilm plans to demonstrate the company’s latest advancements and new products specifically developed to help printers respond better to buyer demands and win more business. Watch the new Acuity LED 3200R super-wide format printer produce high quality display and exhibition graphics for an investment cost close to smaller format machines. Fujifilm technology in LED UV curing and ink chemistry delivers quick start-up without any warm-up delay, requires minimal daily maintenance and produces instantly cured prints. Live demonstrations will also be running on the smaller, but equally dynamic, Acuity LED 1600 II press at our booth. Experience the all-new OnsetM, the innovative B1 (27.8” x 39.4”) format inkjet printer specifically developed to offer a high quality, short run solution for the offset, screen and industrial print markets. The productivity and quality of the new scalable platform will give printers the ability to take lower volume work off their commercial presses and increase overall productivity. This popular format size will also allow printers to open up new revenue streams by delivering cost-effective short run jobs. See the Onset X3, a wide format press print capable of printing in excess of 10,000 ft²/hour (up to 225 beds/hour), with robotic arm media handling automation you’ve got to see to believe. The Onset X3 features three CMYK ink channels plus the choice of white or orange. The Onset X3 sits at the pinnacle of productivity. With this press, users of analog screen printing lines can take the digital route, confident they can print high-quality long runs with superb consistency and reliability. See it live, right before your eyes. Check how the Fujifilm SpyderX combination flatbed/roll to roll press is redefining flexibility. The robust 126″ (3.2 m) wide, 6 color + white SpyderX by Fujifilm and Inca allows for both rigid and flexible printing resulting in a wide variety of applications from menu boards to banners to back lit signs and permanent indoor displays. The SpyderX standard configuration also includes two white ink channels. The addition of white ink allows for printing on clear and dark substrates, as well as layered printing over or under an image, or it can be used as a spot color. Learn how Fujifilm Dimatix SAMBA print heads are revolutionizing the application of ink to substrate through an informative display and demonstration of Fujifilm Inkjet Technology. The SAMBA 42000 print bar jets up to 1200 dpi output quality at output speeds up to 1000 feet per minute, and opens up possibilities for inkjet imprinting applications on traditional analog presses. Samba can also be custom configured for inkjet solutions for industrial print applications. Talk to Fujifilm product experts about the latest advancements in the Acuity Select flatbed presses. The Acuity family of flatbed presses provide the ultimate platform for consistent, near-photographic quality images on rigid, flexible and even roll media. The Acuity Select 20 series features up to eight color channels, including options to run white, varnish and now light inks making it an affordable solution for a number of creative print applications. This incredibly versatile printer is an entrepreneur’s press – your only limit is your imagination. See it in action at the SGIA Expo! See it. Believe it. SGIA Expo 2017, Fujifilm booth 1529.